A barbecue facility made an excellent shack! I visited Narawntapu National Park on 7th February and enjoyed nine contacts before UTC rollover and two in the new day. This park is located on the central north coast of Tasmania, east of Devonport and has many diverse features, bush, long beaches and access to the Rubicon River estuary. Narawntapu National Park was the first in Tasmania to revert to its Aboriginal name and I found it a challenging word to articulate clearly while having contacts. All contacts were with VK3 and VK5 amateurs. On 7.095 I had the following contacts: VK3TJC, Tim; VK3FJAE, Doug; VK5PAS, Paul; VK5MBD, Bill; VK5KC, David and on 14.140, VK5HCF, Col; VK5LY, Larry; VK5PAS, Paul; VK5FRCP, Rex and after UTC rollover VK5LY, Larry and VK5EE, Tom. 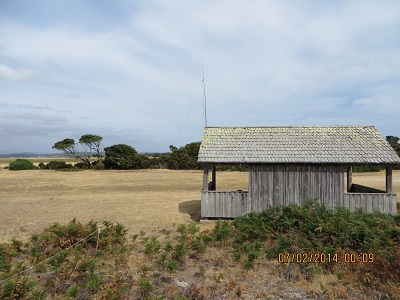 Signals on 40m were generally lower in strength than on 20m and VK5EE, Tom from Mt Gambier was 5 and 9 and I got the same. A Pacific Gull: Rubicon River and Park in the background. I had to pack up in a hurry. We had to travel to Launceston for lunch: we were only half an hour late! A special thank you to Paul, VK5PAS, who alerted the chasers and ensured a successful activation.